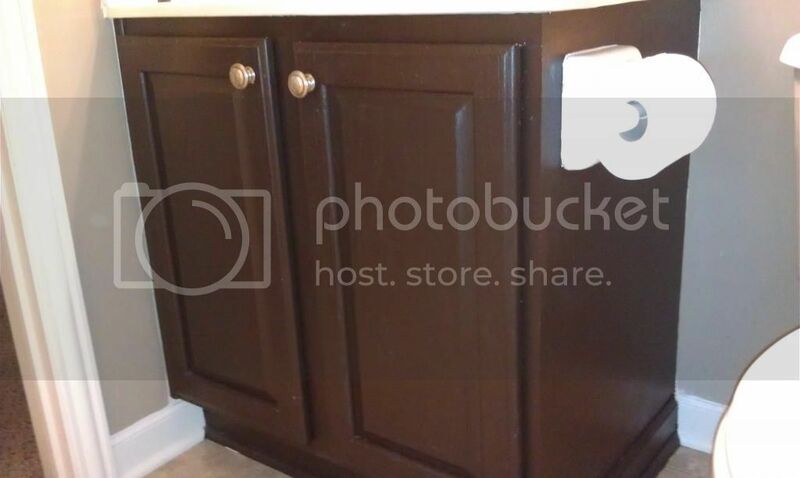 A few months ago I bribed talked my hubs into letting me redo the guest bathroom cabinet. 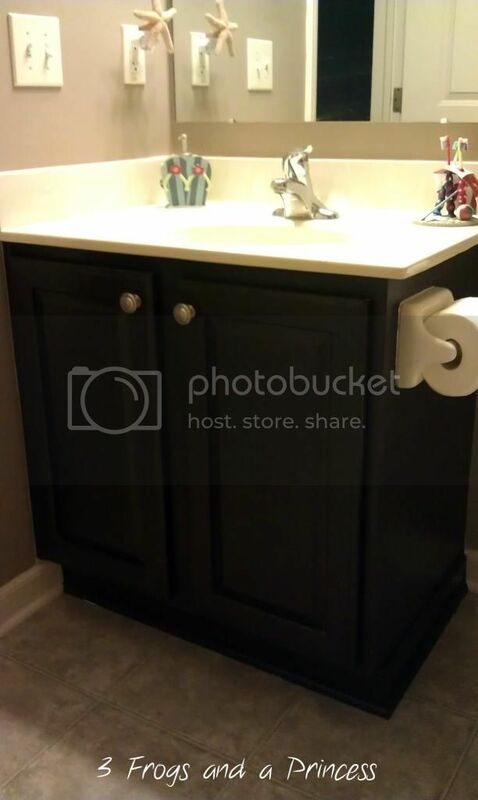 I am not a big fan of natural oak and I hate the fact that none of my cabinets have knobs. I really wanted to start in the kitchen but after a series of "no's" I came to grips with the fact that I wasn't winning. 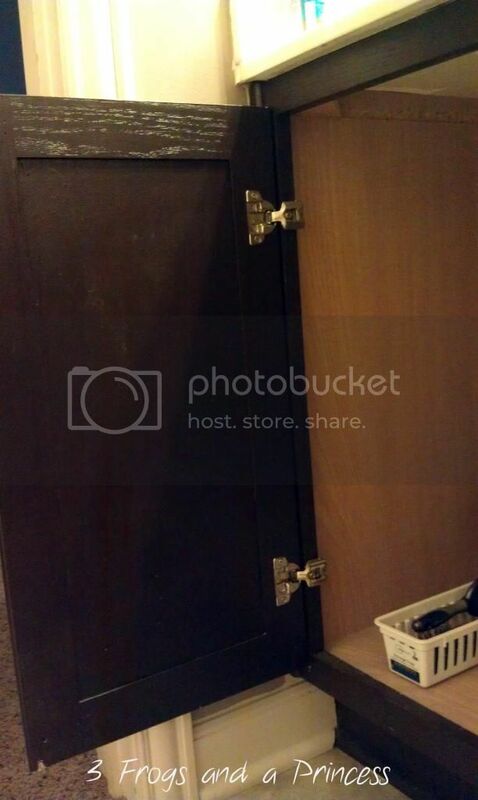 Plus, I guess its smart to test on a $120 cabinet instead of a full kitchen of $120 cabinets. Lol. This was my starting point. Well, with the doors attached origninally. Ugly, ugly, ugly. 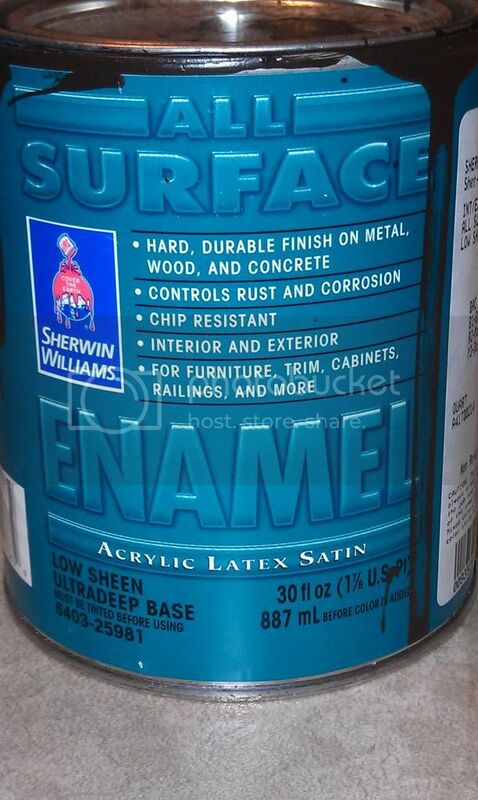 After tons of research and online discussions I ended up at Sherwin Williams. 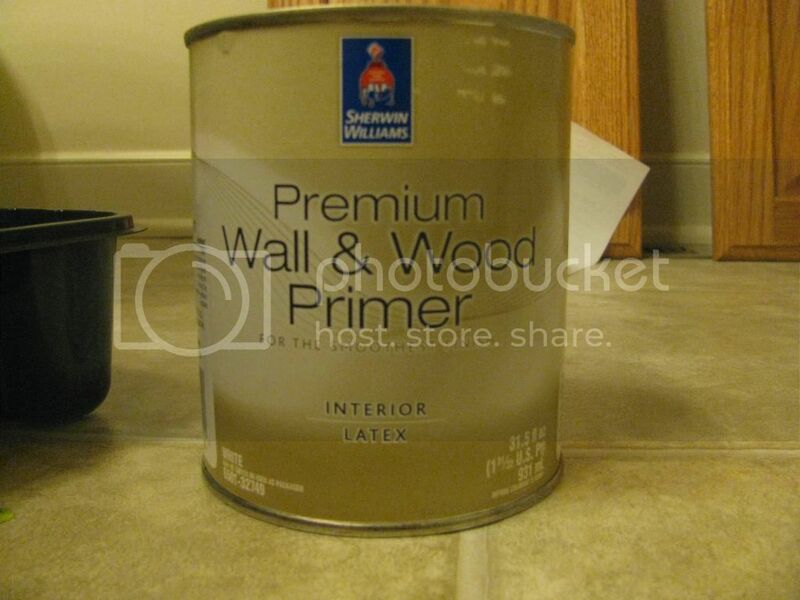 The salesman recommened I start with this Premier Wall and Wood Primer. This stuff is fabulous. Not only did it coat well on my real wood doors but also on the side panel of the cabinet which was a laminate face. I used one coat, applied with a foam roller on the flat surfaces and a foam brush for the hard-to-get places. Once this was fully dry - about 2 hours - I sanded the surface lightly according to the directions. Now for the fun part! I used two coats of this Sherwin Williams All Surface Enamel in Black Bean. I am sooo glad I went with the salesman's recommendation on color because I would have NEVER chosen this off the swatch. If you are using a lighter color the recommended base was the Pro-Classic. I applied two coats, allowing it to dry the full 4 hours between coats. I was shocked at how hard this paint dries! There were no brush strokes visible at all! 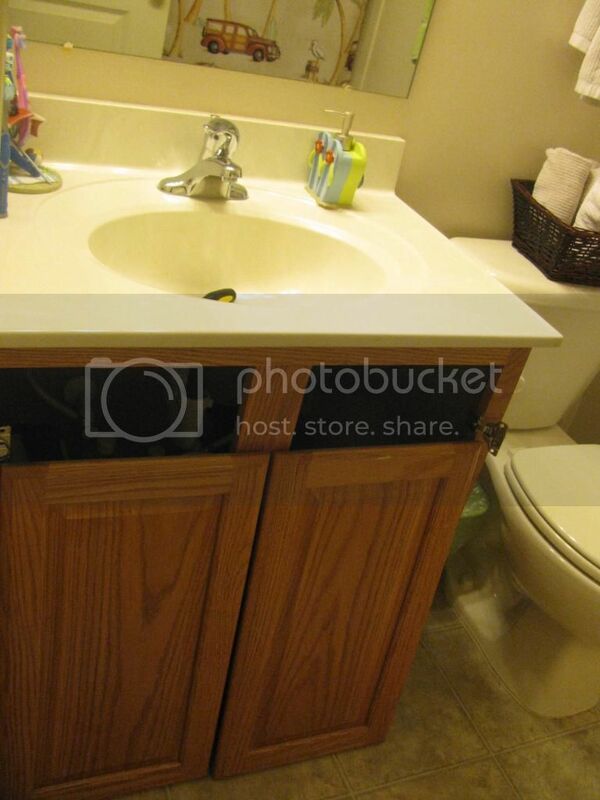 I painted in interior and exterior of the doors and also the "trim" around the inside of the cabinet. I just thought it made it look more professional. WOW! You did a great job! What a difference! I love this color! LOVE it! 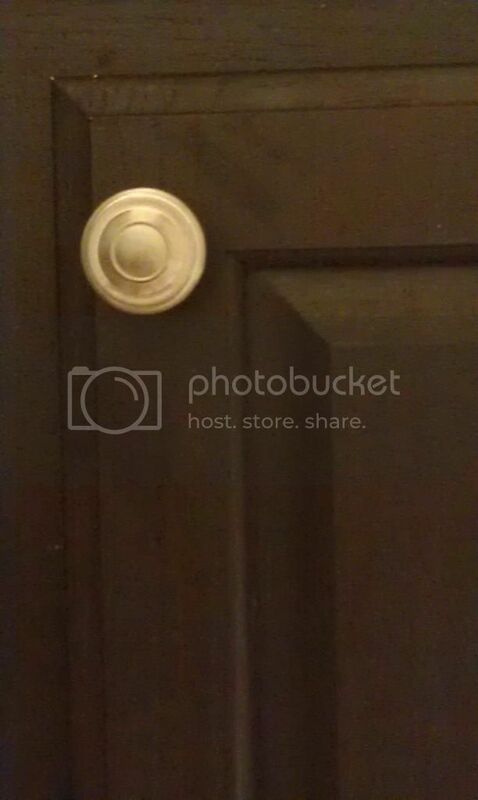 Looks like a different bathroom! Did you sand at all before priming? Or did you apply the primer directly on the previously finished surface? Thanks! Beautiful job :) I'm planning on doing my kitchen, and figure a bathroom would be a good place to start as well!